Environmental protection, urbanization and globalization are the common challenges we all face. And Australia Pavilion focuses on the theme of “Mastering the challenges: Australia’s smart solutions for our urban future”. 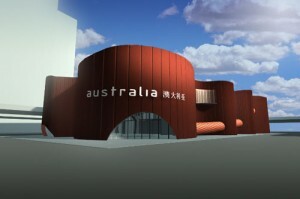 The pavilion will not only illustrate Australia strong and vibrant economy, but also display the world famous research and education institutes, rich culture and nature beauty, at the same time, quality urban life in Australia will be showed. The pavilion comprises three parts incorporating distinct, yet inter-related exhibitions. 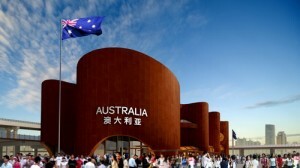 The first part called “Journey” will allow visitors to obtain a basic understanding of Australian society, its international population and its cultural diversity. Pictures and interactive exhibits will profile Australia’s landscape and territories and tell the stories of the country’s history and people. A ramp will lead visitors to the second part, which features a 1,000-seat theatre screening a multi-media show that explores the country’s major cities, tourist destinations, economic dynamism, cultural diversity, friendly people and high living standard. Daily performances will be staged in the last part of the pavilion. Visitors will be invited to taste authentic Australian cuisine, sip some fine red wines and buy Australian products. This entry was posted on Thursday, December 17th, 2009 at 11:21 am	and is filed under International Participants' Pavilion, Pavilion. You can follow any responses to this entry through the RSS 2.0 feed. Both comments and pings are currently closed.